What is RF Record and Playback? Today’s Real-Time Spectrum Analyzers offer capabilities to capture and record RF data vs. time for playback and analysis. This is extremely helpful if you’re trying to find the proverbial “signal needle” in the haystack. This page discusses the solutions available to you, to help you find your signal of interest faster. RF recording and playback system have traditionally involved complicated system of hardware software that was both expensive and cumbersome. As technology has evolved it is now possible to put those large systems into a smaller, easier to use and less expensive package. Rather than being limited by a simple screen shot, engineers now have the ability to accurately record RF signals for long periods of time, and analyze this information in an efficient and timely manner. Complex analysis of ECM or RADAR systems, capturing RF interference are just some of the applications that are addressed with this simple combination of hardware and software. Tek’s Worldwide Spectrum Allocations Poster, showing the dense packing of RF and microwave allocations. A copy of this poster is available to download here. A typical recording and playback system includes both hardware and software. What are the components of a RF Record and Playback System? RF record/playback systems fundamentally are composed of three different parts: receiver, storage and analysis/playback. Receiver: modern real-time spectrum analyzer take advantage of the integrated IQ process to digitize all of the signals with the real-time span. Storage: PC’s and laptops can be easily configured to stream recorded IQ directly to disk. You’re then able to define your own capacity based on your application. Analysis/Playback: ideally, this is the same platform you used to collect your data so you can avoid spending large amounts of time transferring files. For instance, Tektronix enables engineers to directly analyze the recorded RF through DataVu-PC software, run on your own storage device. Recording in the field and analyzing in the lab has never been easier. 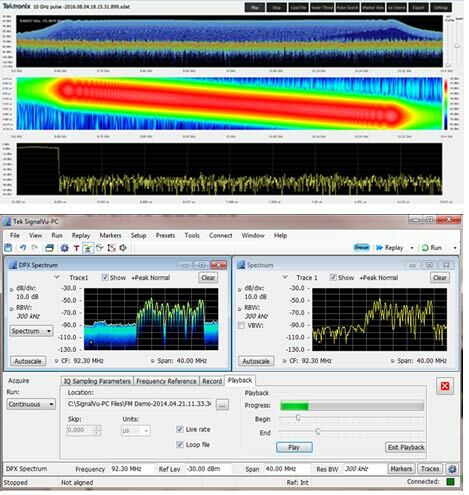 Depending on your application, Tektronix offers numerous Real-Time Spectrum Analyzers to help you capture large amounts of data for storage, analysis and playback. Options like the small form and tactical RSA306B, RSA500 or RSA600 units, offer low cost, high performance, field or lab use. The robust capabilities of the benchtop RSA5100 and RSA7100 analyzers, support streaming at bandwidths up to 800 MHz. Coupled with DataVu-PC and SignalVu-PC, Tektronix offers a simple and straight-forward RF Record and Playback solution. DPX density trigger activated by the “Trigger on This” allows the RSA to trigger on signals underneath other signals when separated by time or distinguished by their density of occurrence. The top screen capture is a playback of a 10 GHz pulse on DataVu-PC. The second screen capture below it, is the playback of the 92.3 MHz FM channel with SignalVu-PC. 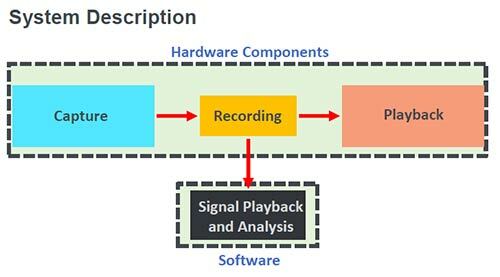 Tektronix offers complimentary analysis software, SignalVu-PC and DataVu-PC, to support recording and playback solutions. DataVu-PC has been specifically designed to search through long recordings to automatically identify signals of interest based on user input. It has full real-time playback of captured signals, automatic identification of pulse signal types, supports exporting IQ to industry standard formats, and supports two-channel IQ recording as well. SignalVu-PC is designed to support playback and demodulation of captured signals. It is a full vector-signal-analysis powerhouse that’s also offers fully automatic RADAR analysis. Some of your best options for Record and Playback are below. Click on the buttons below to learn more about individual products, or you can read our application note on RF Record and Playback here. Tektronix offers multiple real-time spectrum analyzers that are powerful and portable options. 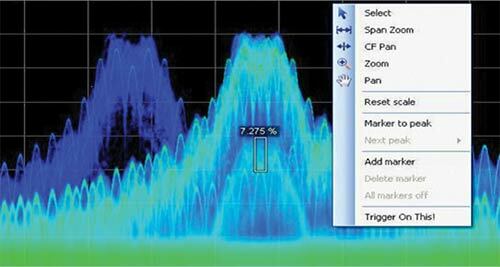 Visit our spectrum analyzer page to view all of your options. The RSA7100 is another Real-Time Spectrum Analyzer that offers analysis up to 800 MHz bandwidth and streaming storage up to two hours of seamless data at full bandwidth in one solution. Your go to software for Record and Playback. When combined with the signal recording capabilities of all Tektronix USB and PCIe-based spectrum analyzers, DataVu-PC can turn hours of attended monitoring into fast post-acquisition search, mark, and measurement tasks. Analyze your results without adding the extra step of conversion software.